This Lunar New Year (February 5th) we’ll be ushering in the Year of the Pig, which many believe will be a year of good fortune and prosperity. And nothing says prosperity and good luck like feasting your heart out on delicious delicacies with family and friends. Even better if you can just sit back, relax, and let all the good eats come to you. For those who don’t want to cook at home this Chinese New Year, these are the most delectable CNY menus on offer at some of our favourite Asian dining destinations in Singapore. This CNY Cherry Garden will be going all out with a huge spread of epicurean delights including five different yu shengs (traditional Cantonese tossed salads). Start with a Golden Fortune cocktail from MO BAR, consisting of gin infused with barbecued pork, dry vermouth, gold leaf and aromatic fat oil. Then choose from an array of enticing menus with specialities like yu sheng with Alaskan king crab and caviar, crispy wasabi-aioli prawns, and roasted crackling pork belly and beef in black pepper sauce. There will also be special dim sum brunches on the weekends. Price: CNY dinner menus start from $128++. CNY dim sum brunch: $98++ per person. Housed in the historic Fullerton Hotel, Jade is an elegant spot for a CNY celebration with plenty of room for large parties including two private rooms and two partitioned areas. The Lunar New Year menus range from multi-course meals for one to abundant feasts for up to 10 people. 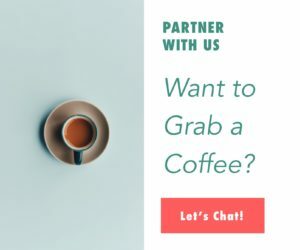 Depending on which menu you choose, you could be dining on salmon yu sheng with champagne jelly and honey pineapple dressing, fragrant wok-fried five-grain glutinous rice with Chinese sausages, or roasted duck in Jade’s secret sauce. Named after the Min River in China’s Sichuan province, Min Jiang offers authentic Sichuan and Cantonese cuisine and an array of spaces to dine on those delish dishes including a softly lit dining room, six private rooms, and an al fresco area next to the hotel’s main pool. CNY will be an all-out affair with tons of enticing gourmet creations like the claypot with braised pork belly, pan-fried lotus root pork patties, abalone, and black moss, and the Prosperity yu sheng with salmon and crispy salted egg yolk fish skin. Price: Lunar New Year 6-course set lunch: $488++ per table of 6 people, $688++ per table of 10 people (from 18 Jan to 1 Feb only). 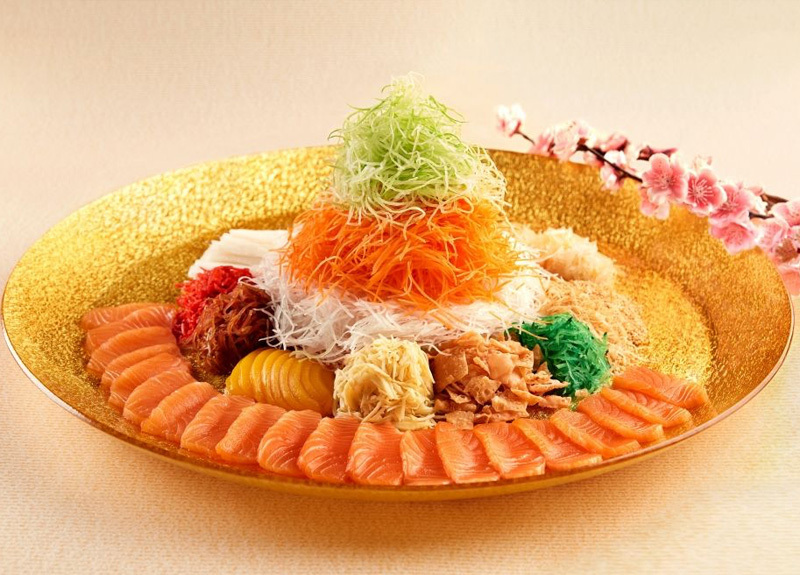 Lunar New Year set lunch & dinner menus start from $118++ per pax (min 2 people). 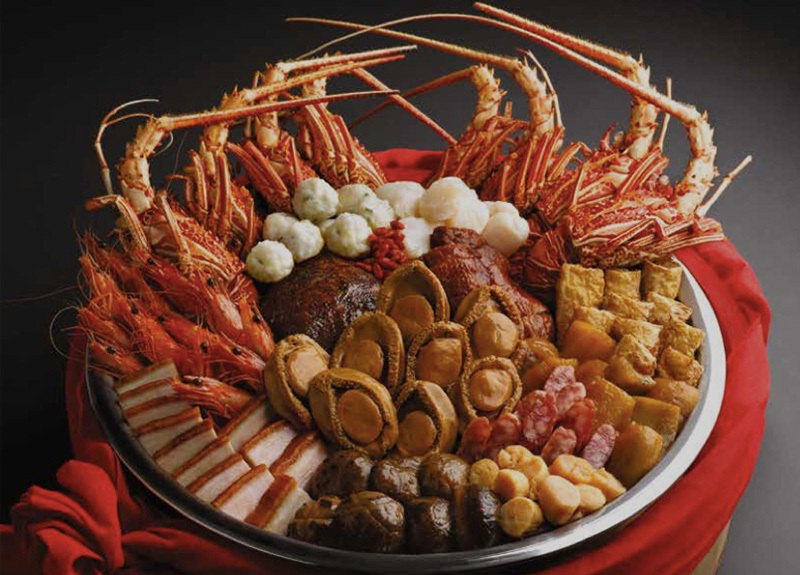 Lunar New Year 10-person set lunch & dinner menus start from $888++. Start the New Year right with exquisite gourmet eats at Yan Ting in The St. Regis Singapore. Opt for a la carte selections like the yu sheng with Norwegian salmon and “Pik Fong Tong” style crispy chicken, or round up a group and indulge in one of the special set menus with offerings like braised 10-head abalone with oysters and black moss and pan-seared kurobuta pork with homemade sauce. They also have takeaway dishes so you can celebrate at home without slaving away in the kitchen. Price: CNY set lunch & dinner menus range from from $118++ (min of 2 people) to $3888++ per table of 10 people. 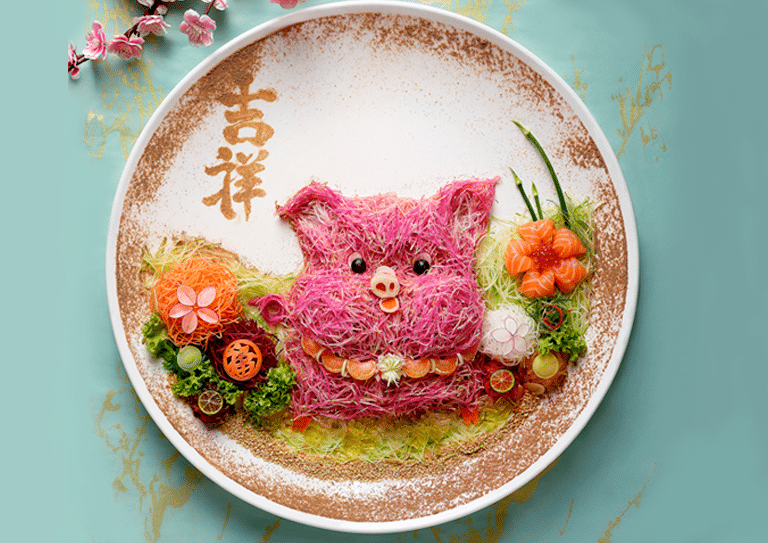 One Michelin-starred Summer Palace is offering the ultimate abundance this Lunar New Year with 11 special set menus crafted by executive chef Liu Ching Hai and his talented culinary team. 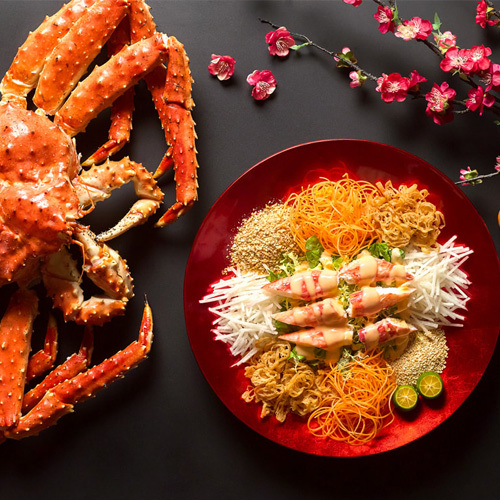 Each menu features decadent dishes made with exquisite ingredients like the yu sheng with marinated Hokkaido clams and jellyfish, suckling pig with roasted duck, and sauteed lobster with egg white and conpoy. There are also free-flow options to make your meal that much more festive. Treat yourself to succulent seafood, hearty grilled meats, and vegetarian delights at Wah Lok Cantonese Restaurant this Lunar New Year. 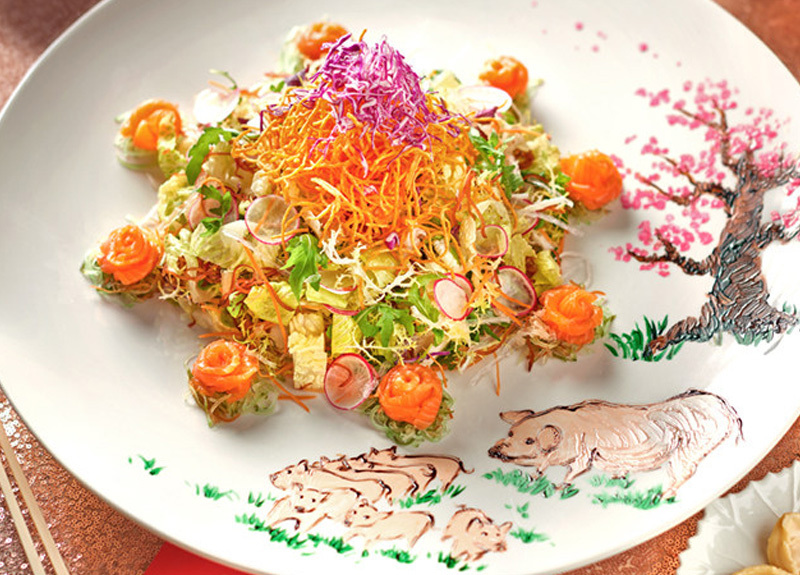 Savour classics like the signature Alaskan crab lo hei and braised abalone with mushrooms and vegetables or go for one of the special festive creations like the Auspicious Golden Pot packed with deer sinew, goose web, morels, pork ribs, fish maw, cabbage, chestnut, and black moss. There are menus to suit parties of all sizes from solo diners up to tables of 10.